Our Bavarian Cream Recipe so that you get to try this amazing and delicious dessert at home! Make the cream and let it set in pots to serve as dessert with your favorite toppings or fruits. Watch my quick and easy how to make Bavarian cream video further below. 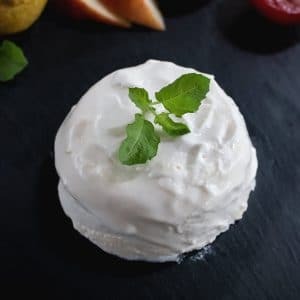 Bavarian Cream, also advertised as Crème bavaroise in some places, is a custard-like cream, which can be served as a dessert or can be used as a Torte filling or in other sweet cake fillings. Bavarian Cream is prepared with Egg yolks, whipped cream, and gelatin. Other ingredients include milk, sugar, and flavoring such as vanilla. It’s not clear how the dessert got its name because the Bavarian Cream is a French haute cuisine dessert. The Bavarian Cream, egg custard, Boston cream custard, and pannacotta are all very similarly prepared and that’s why these pastry creams tend to be confused easily. At the same time, I noticed a lot of people mixing up the terms without realizing that there is a difference, although at times a subtle one. I triple checked the terms with the Culinary Encyclopedia – The Larousse Gastronomique to clarify it here. Bavarian Cream is prepared in a water bath binding technique by slowly heating up the ingredients. Whipped Cream adds the creamy lightness to the dessert and the gelatin helps to keep it firm. The Bavarian cream is then left to set in a mold and served cold. 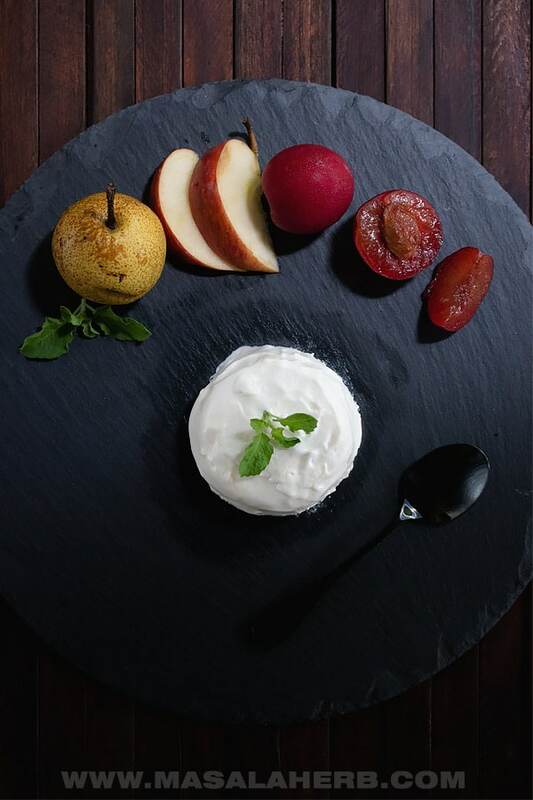 The Bavaroise can be flavored with wine, fruit juice instead of the milk. Another idea is to add fruit puree, chocolate, lemon zest to the whipped cream. Or you can flavor different batches to create colorful flavored layers. Bavarian Cream can be served as a stand-alone dessert or can be used in a variation with less or if you must, without gelatin in cakes as a filling. Custard is made of whole eggs or egg yolks and milk or cream. The sweet dessert can be served hot or cold and can be enjoyed (just like the Bavarian cream) in a pot as a stand-alone dessert or is further used in a more liquid version in pastries and cakes and sometimes in a hot and very liquid state over cakes. Basically, there are countless versions of custard including as a baked version, but custard never includes whipped cream and gelatin as does the Bavarian Cream so this is a major difference here. Boston Cream also includes eggs and milk but this cream includes cornstarch as well, which thickens the cream. Boston Cream is American and it’s used as a filling in pies and doughnuts. Panna Cotta is an Italian dessert prepared with Cream, sugar, flavoring and most of the time with gelatin as well. A pannacotta is usually served by turning it onto a plate and garnished with coulis or caramel. 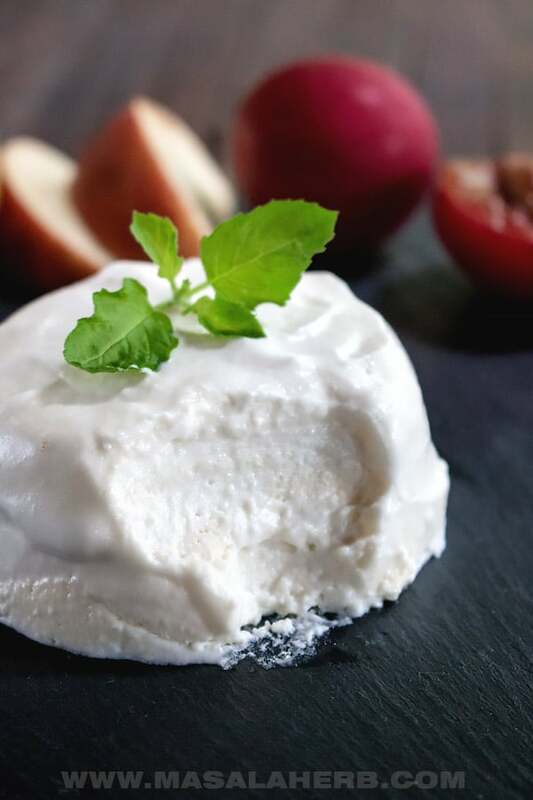 The major difference with pannacotta is that it doesn’t include eggs and it’s only used as a stand-alone dessert and never as a filling for cakes and pastries. To prepare a homemade Bavarian cream you will need basic ingredients. Only Egg Yolks are used in a Bavarian cream, use the egg whites to make Macaroons or Meringue. Egg yolks help in binding the bavaroise. The Whipped Cream needs to contain more than 40% fats (which most do) so that it whips up without falling flat. Whipped cream adds the creamy airiness to the dessert. I use Powdered Sugar because it mixes in properly without having to deal with chunks and the Milk thins out the egg-sugar mix and helps to bind the yolk. I usually flavor my bavaroise with Vanilla, such as vanilla bean paste or vanilla extract. The Gelatin is necessary to give the dessert the amazing firmness so that you can take out your Bavarian cream on a plate for presentation. I always use the Dr.Oetker Gelatin, that’s the best one so far. I don’t work with vegetarian-friendly Agar-Agar because I don’t like the taste, so I can’t help you with that. Even if you present your Bavarian Cream in a pot, you will need gelatin so that it keeps its airy shape. How to make Bavarian Cream? How to serve Bavarian Cream? 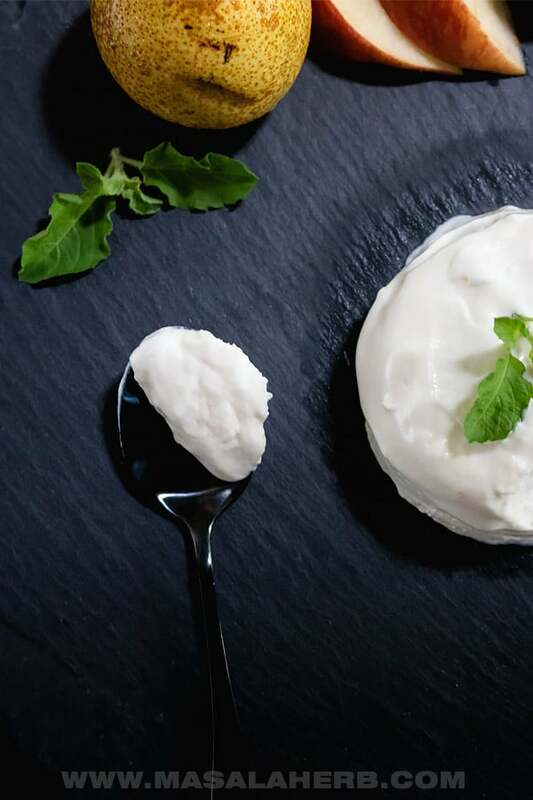 Decide if you want to serve your Bavarian Cream in a mold, such as a ramekin, or a serving glass or if you want to turn the set and stiff cold cream on a plate. Keep in mind that serving in a pot, without taking the cream out, is the easiest option. I personally dislike taking out my Bavarian cream because it’s kind of tedious, BUT the Bavarian cream served on a plate looks simply better. You could use soft & non-sticky molds such as silicon molds so that the Bavarian Cream comes out easily. Bavarian Cream is a French haute cuisine dessert. Nobody knows exactly where the name came from, but what we know is that it's super delicious! The cream dessert is prepared with simple pantry ingredients and is cooked on super slow heat over a hot double boiler (water bath/bain marie). Separate the yolks from the egg whites. Use the whites for another recipe. Add the sugar to the yolks and beat until the mixture turns lighter in color, kind of beige. Throw in the vanilla aroma essence and mix it all well. Prepare a hot water bath (aka double boiler/bain marie). Heat up the yolk mixture and pour in the milk. Mix it all well and use a whisk at this point. Control the heat while whisking continuously. You need to get the heat slowly but steadily to about 84 Celsius/ 183 Fahrenheit. In the meanwhile keep the gelatin to soak in cold water. Once the gelatin is soft remove the water from it and pour some of the hot yolk mixtures onto the gelatin. The gelatin will melt and mix into the yolk mass. Pour this now into the whole yolk mass and mix it in. In another bowl pour in the whipping cream and whip it to a stiff airy cream. Take the yolk mass and whisk it into the whipping cream until completely incorporated. Keep your molds ready and fill them with the mass. Store the molds with the Bavarian cream in the fridge so that it cools and gets firm. Wait for 10 hours before taking out the molds. 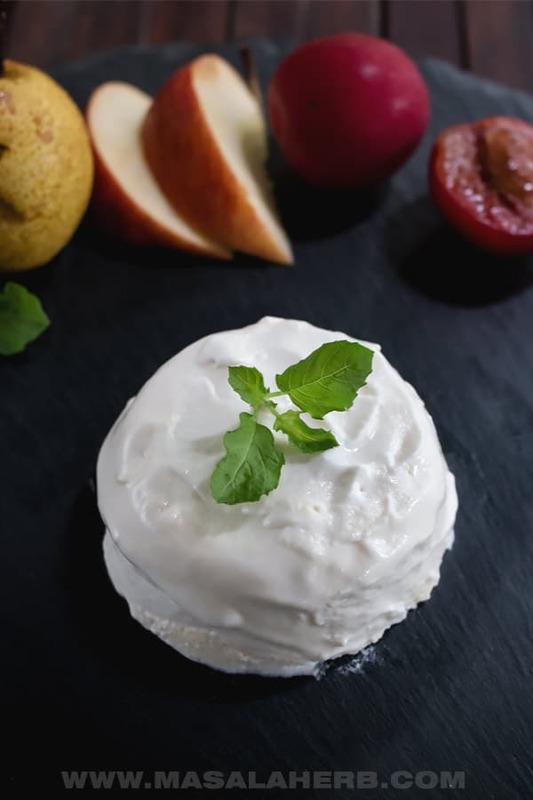 You can serve the bavarian cream in the molds or you can turn it upside down on a plate, for that keep the mold with the cream in a warm water bath so that it loosens and comes out. See further serving suggestions in the post. The yolk+sugar+milk mixture has to heat up slowly so that the yolk can bind. That is why you use a hot water bath. Keep an eye on the temperature. You have to use a thermometer. Dear Reader, How are you going to serve your Bavarian Cream? Hi, this may be interesting you: Bavarian Cream Recipe!